Some books are meant to be read once, others are meant to be reread until the pages fall out. 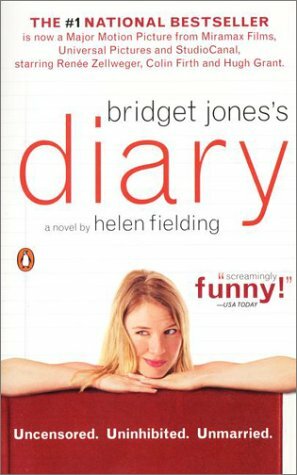 Bridget Jones’s Diary by Helen Fielding falls under the second category. While I wouldn’t go so far as to call this book a literary masterpiece comparable to the works of Maya Angelou, Jane Austen, or the Brönte sisters, it really is quite a book. Its unflinching and comic portrayal of single women (singletons) and smug marrieds is absolutely spot-on. True to its name, this book reads like an actual diary with daily entries where Bridget tracks everything from her weight to her calorie consumption, cigarette count to alcohol units. You’ll see her mood fluctuate along with her weight as she goes from one addiction to another—moving from cigarettes to lottery tickets and afternoon cocktails to smoothies. With every confession Bridget makes, she also voices out the reader’s innermost fears, nagging insecurities, and irrational musings. Whether it’s a tendency to weigh oneself obsessively, count each calorie, chase after the “wrong” guy, smoke too many cigarettes, consume copious amounts of alcohol before 5 p.m., or rely too heavily on self-help books to solve romance and self-esteem issues—Bridget’s candid confessions will strike a chord somewhere. In my case, this book brought to light my unhealthy belief that my happiness is inversely related to my weight—that I would only truly be happy if I were a size 2 or less. Bridget’s incredible relate-ability and likeability makes it easy for any reader to sympathize with her. When her womanizing boss, Daniel Cleaver, trades her in for a “bronze giantess”, you’ll feel that rejection. When the swoon-worthy Mark Darcy asks her out, your heart leaps a little. And every time her mother enters the picture, you kinda want to strangle her mum a little bit—just like Bridget. It’s that relate-ability which makes this book a real gem. Another plus factor for this book is how real-sounding the rest of the characters are. Sure, we’re seeing them through Bridget’s eyes, but without being verbose, Fielding manages to create standout characters with unique voices and quirks. All in all, this is the type of feel-good book that I’d recommend to anyone looking for a bit of fun. Definitely one of the best books I’ve read in the last two years.